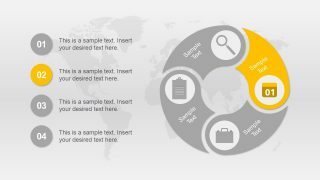 Circular Connected 4 Steps PowerPoint Diagram is an astonishing free template for four step processes. This circular diagram of is an exceptional way of representing iterative process such as strategy, development, monitoring and control or continues improvement. Circular connected diagrams are an effective way of illustrating activities which are cyclic in nature. 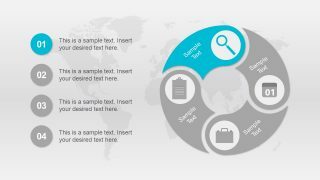 The multi-purpose template is useful in displaying charts, business models and more. Moreover, it helps display the idea in systematic manner by dividing essential information in four distinct steps. Cognitive decision making is another application of this diagram for business managers to implement verdicts rapidly. 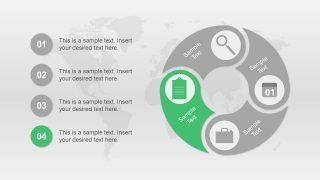 The creative design of Circular Connected 4 Steps PowerPoint Diagram segments has round shapes instead of arrow point chevrons. The round shapes in this PowerPoint are influenced by Chinese philosophy concept of yin yang. This demonstrates how the sections are different but inseparable. In like manner, every segment is valuable and none superior to another. The deck of six free slides has colorful segment of amazing infographic icons. These slides also contain placeholder to add text with circular bullet points. 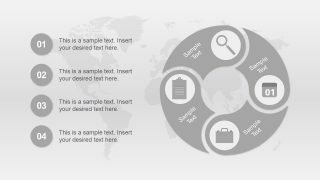 The background of this template has translucent grey world map depict its usability in several scenarios. The icons representing each step include, magnifying glass, calendar, briefcase and report chart. Whereas, the color of individual shape separates section through numbers in placeholders. This is fully customizable set of six slide PowerPoint. 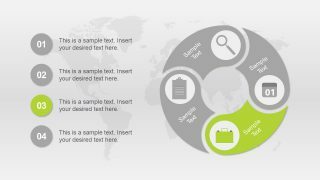 This enables users to change different visual aspects of this template. Such as, theme and shape colors, font, size, background and layouts. Insert company logo, trademark, contact information in fraction of time. To do so, add text placeholder in slide master option to insert placeholder. 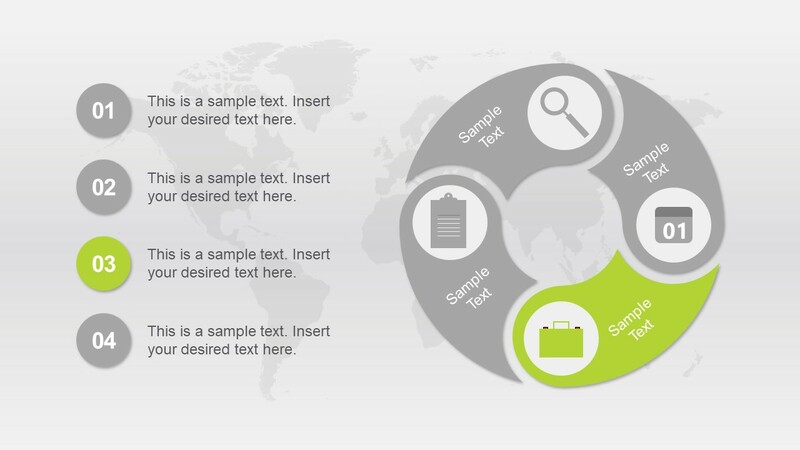 Apart from editing elements, the diagram and its object are usable in other business presentation. 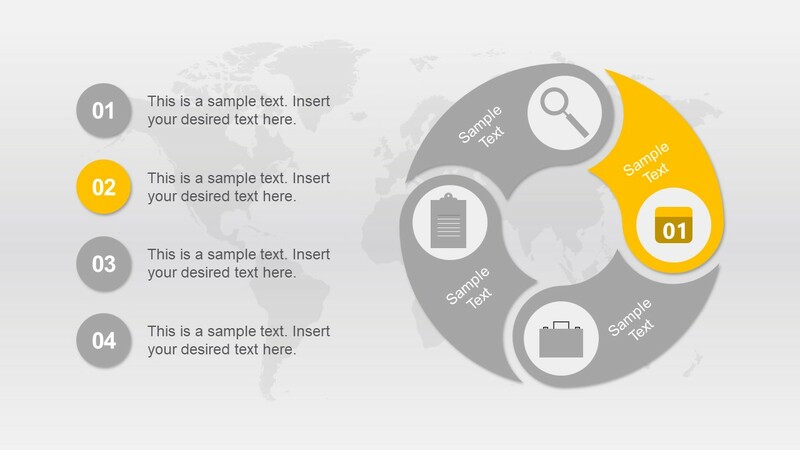 The 4-step connected circular diagram for PowerPoint shows each process with precision. The presentation helps conceptualize the essential processes through graphics. It is suitable for business experts to communicate ideas and present creativity. Further, impress executive audience for fast decision making without going through detail paper work.